There has not been much going on in my life lately. I guess that is a good thing. Jim went to Washington, DC in May for a business trip, which was nice as he got to see Andy and Megan as well. I stayed here with the dog, and participated in a pickleball clinic. It took place over a three day time period at Lake Forest Country Club, which is quite a haul from my house. I met up with two other ladies I know at a convenient location, and we carpooled together. It was nice to have company on the long drive, and to rehash what we learned on the way home from each lesson. While I play pickleball for fun and fitness, I do want to be able to play the best game possible. There are some serious competitors at several of the locations in St. Louis, and I want to be able to hold my own. I might not ever be as good as them, but at least I hope not to embarrass myself. A guy from California came in to teach the clinic, and I have to say that I think my game has improved from keeping his tips in mind. 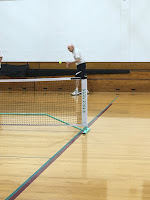 My true idol in pickleball, though, is Harold. Recently widowed, this 89 year old youngster lives in a nearby community with his granddaughter, who had moved in to help care for Harold's wife. 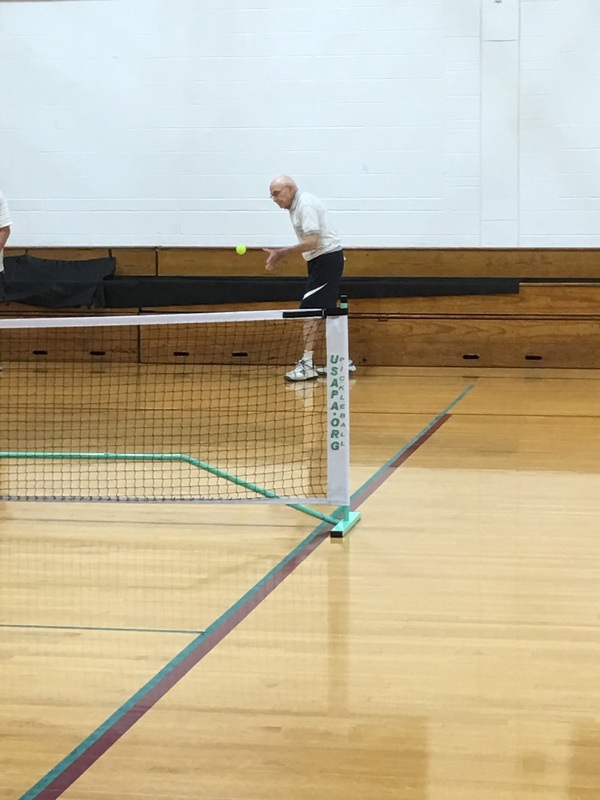 He began playing pickleball a couple years ago when he could no longer continue with his golf and tennis games! I see him on the courts three times a week, though he may play elsewhere as well. He is incredibly sharp, a super-nice guy, and an inspiration to the rest of us. We did make a trip up to Iowa for Memorial Day weekend to see my in-laws. I had not been up that way for awhile, though Jim and Katie made a quick visit there over Christmas while I was here waiting for Andy and Megan to arrive for the holidays. It was great to see everyone and catch up. 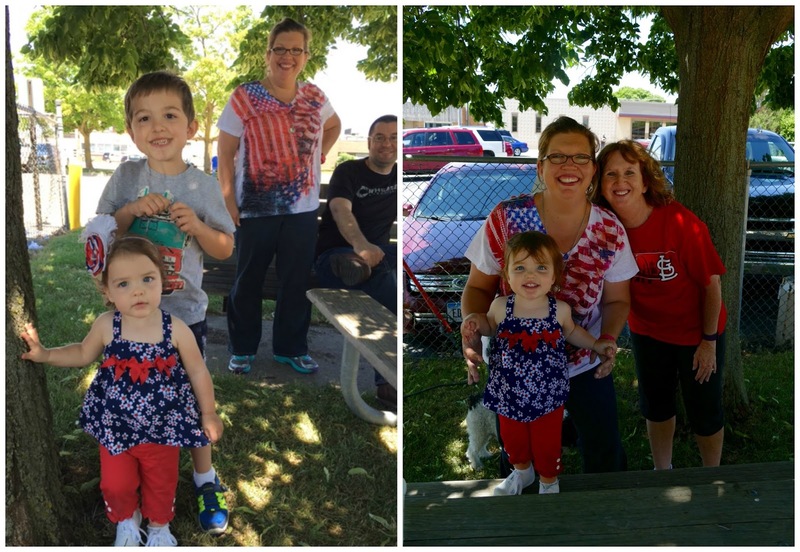 A bonus was that my niece and her family from Dallas were also in Iowa that weekend. They were going to Marshalltown on Monday, so we drove a little out of our way as we headed home to St. Louis and met them for lunch. We had never seen their youngest child, Hazel, and she will be two this fall! I can't even express how wonderful it was to see the four of them. I so wish that we all lived closer. This Saturday the Women in Focus photography group is meeting to shoot photos of the graffiti wall downtown. I took some graduation pictures of my great-niece there a couple summers ago, and it is definitely a cool place to go - when it isn't hotter than hades. A temperature in the 90s is predicted for Saturday. We aren't meeting until 10:00, which isn't the greatest time for shooting with the sun much less the temperature. You'd think photographers would know better - ha!